If you have a garden, or plan on creating one, there is no reason to not plug it into the greater ecological system. After all, we are all tiny but important cogs in it, and everything affects everything else to a lesser or greater degree. Combined all together, these factors took a terrible toll from the honeybee populations. Based on the study commissioned by the Natural Resources Defense Council, in 2015 alone, 42% of bee colonies suffered collapse. And given the fact that bees hold a vital role in the food chain supply as industrious pollinators, you can see why it is important to tweak your garden to make bees’ lives easier so they can once again establish thriving colonies. Furthermore, as you take such considerations to heart, you would at the same time attract beautiful butterflies because they both share the same food – flower nectar. Unlike in human societies, plant diversity is actually beneficial. Although some bees are forage generalists, like Leaf Cutter Bees and Honey Bees, some bees specialize in certain flowers only, like the Sunflower Bee. Believe it or not, there are actually 4,000 different native bee species in US alone. The most known bees – the Honey Bees – are not native to US, but they are the most productive bees when it comes to honey, hence their name. Bees have evolved their feeding organs to align with certain flowers. Therefore, the bees’ tongue, body shape, and size will determine which flowers they will be able to access. Same goes for butterflies. For example, tubular flowers will be more suitable to bees with long tongues, but will not work out for bees with short tongues that Honey Bees have. Unlike butterflies, bees need both nectar and pollen for food. The degree to which plants offer these nutritious substances vary greatly from plant to plant. Along with plant diversity, you should plant flowers with the philosophy of staggered blooming in mind. This simply means that, as different plants bloom at different times, you should have plants that bloom during the time that other plants have stopped blooming. This way, you will ensure a steady supply of nectar and pollen for bees and butterflies through the majority of the year. In addition to staggered blooming, choosing perennial plants will ensure that your need to maintain the garden is significantly lessened, as perennial plants can regrow for multiple years on their own. Once the perennial plants have finished their cycle, they will have to be dug up in order to be divided and replanted. The timing of this varies from plant to plant, but there are some perennials that need no division at all – peonies. You would only need to divide them if you want more of them. Some of them are transitional so they can be put into two columns, but this categorization refers to the majority of their blooming periods. 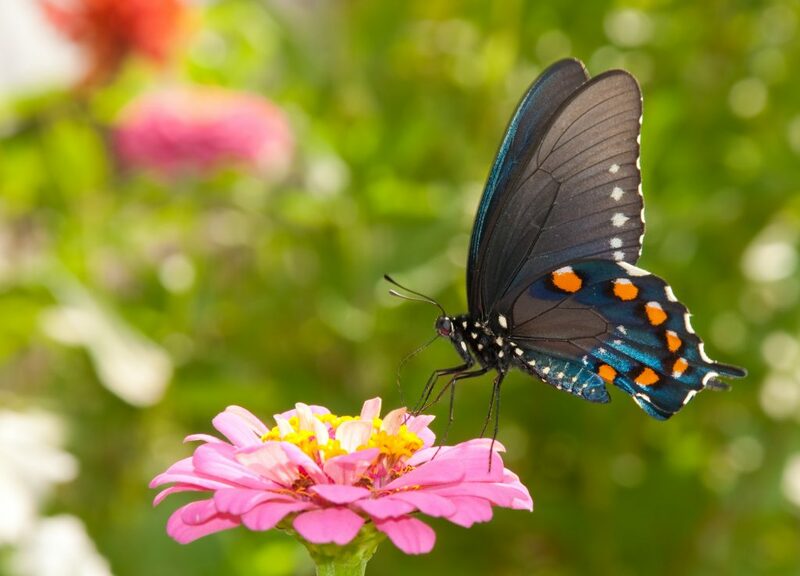 Butterflies will especially hone in on perennials such as lilacs, coneflowers, butterfly weed, and asters. And the mint family of plants will also provide a solid source of nectar. If your intention is to attract more butterflies than bees, then consider planting flowers that bloom in the period from mid to late summer, as this is the period when most species of butterflies are at the height of their activity. Also, consider planting flowers that have multiple florets, as they tend to produce more nectar than other types of flowers. If you want to help bees thrive, under no circumstance should you deploy pesticides. This can literally wipe out entire bee colonies, as a single bee worker can bring that poison to the queen, thus killing her and the entire hive. Use natural enemies of pests to your advantage, who at the same time leave your bees and flowers intact. Brown garden snails, aphids, flies, and mealy bugs will engage most pests in your garden, serving as its guardians. You can buy them at most specialized garden stores. You can make your own insect spray by combining repellent properties of onion, hot pepper, and garlic with the insecticidal properties of liquid soap. However, its use should be light and only as a last measure, because it can prove to be fatal to beneficial pollinators. In addition to DIY sprays, you can use microbial insecticides such as Bacillus thuringiensis, but be careful to not apply it directly to caterpillars (transitional form of butterflies). Deploying parasitic nematodes. These microorganisms will seek out underground pests by releasing bacteria into their bodies. Unlike the DIY spray, they are completely safe for everyone involved – bees, people, pets, environment…all except for 230 species of soil pests. Furthermore, as you decrease/cease the use of pesticides, other natural enemies of garden pests will emerge – lacewings, spiders, ground beetles, and ladybird beetles. Also keep in mind that there are always some innovative, non-harmful methods popping up to deal with garden pests and parasites, so venture out regularly online searching for terms like “organic gardening”, or “organic pest control”.